This month’s Highland Woodturner online newsletter features a story by Tom Soles, a woodturner in Washington DC who has been searching for years for the perfect lathe setup. 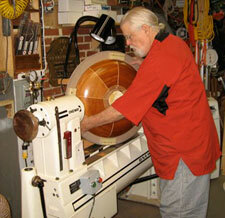 He finally achieved it and tells us how he did it in this fascinating article: One Man’s Lathe Setup. Go take a look! Curtis Turner: Making a Finishing Turntable Lie-Nielsen Scrapers – Why you want one in your toolbox!